This waterproof Transmitter Pendant is perfect for users who may find themselves in vulnerable situations. It is easy to use, features a call button that can transmit a signal to any MPPL receiver. 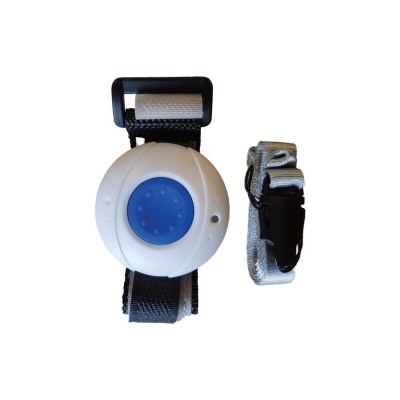 Cost effective, discreet and simple to use, the Splash Proof Transmitter Pendant with Lanyard uses a simple call button on the front of the device that can be used to send a signal to a MPPL pager. Its waterproof design makes it suitable for use in the bathroom or outside, while a lanyard that comes with the pendant makes it well suited to early, mid and late dementia sufferers. Please note that the Splash Proof Transmitter may not be suitable for some older versions of the MPPL pager. Please bear this in mind when placing your order. The Splash Proof Transmitter is designed to prevent users from running into vulnerable situations, with its easily identifiable "call" button which is located in the middle of the device. The transmitter features up to 10 call buttons and can be paired with any of the receivers in our MPPL Range. Easy to set up and use, the transmitter's "call" button is large and low-dexterity friendly, while the lanyard that is attached to the device prevents it from becoming lost. Its simple design is perfect for sufferers of dementia or uses who may find themselves in vulnerable situations. The transmitter promises to withstand the test of time, with its waterproof design protecting it in bathroom environments or in outdoor, rainy environments. It's user friendly, and features a rubber construction that is easy to hold and grip even in wet conditions. The device is incredibly easy to set up too, featuring batteries which are included for instant use upon arrival.